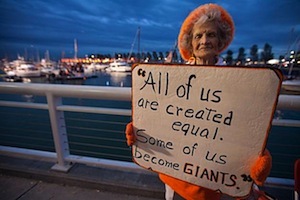 The San Francisco Chronicle’s website, SFGate.com, has a gallery of photographs of Giants fans up right now. Click here to see the whole set. Take an incredibly photogenic city with a beautiful park and a colorful local population, fold in the palpable anticipation of a half-century-overdue championship, and you get some pretty great pictures. Congrats again, Giants fans! We hoped you liked reading Photo Evidence! Giants Fans Excited About Something by Leo Martin! Isn’t that the same lady they showed on TV after the Giants won who was at the front of the crowd at Moscone Center watching the game on the big screen they set up there? I’m glad she got to see them win it all!